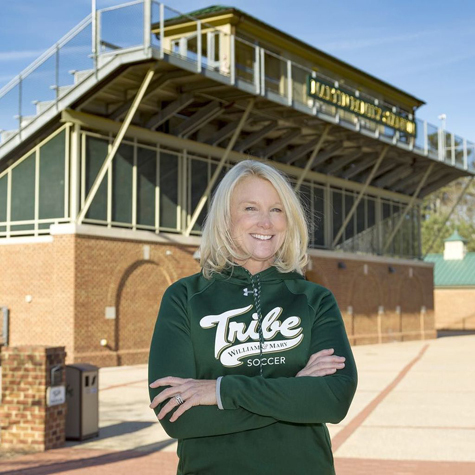 William & Mary Director of Athletics Samantha K. Huge announced the hiring of Julie Cunningham Shackford '88 as the third women's soccer coach in school history on Wednesday morning. "This is an extraordinary day for our program," stated Huge. "Julie Cunningham Shackford is the complete package. She is a nationally respected name in the soccer community who has had success at the highest levels of the sport within an academically challenging atmosphere. What's more, she is an alumna who is passionate about William & Mary and energized to build on the great legacy we have in place." A 25-year coaching veteran and former national coach of the year, Shackford owns a 245-130-33 record (.641) as a head coach with stops at Princeton and Carnegie Mellon. "I am incredibly honored and proud to be coming home to William & Mary," said Shackford. "I am grateful to Director of Athletics Samantha Huge and the Tribe for giving me this once-in-a-lifetime opportunity. I am also forever indebted to [former W&M Head Soccer Coaches] John Daly and Professor John Charles for allowing me to wear Green and Gold. I cannot wait to work with our amazing student-athletes and build upon the incredible success the program has enjoyed for more than three decades. My staff and I will work tirelessly to win CAA Championships and help guide our student-athletes' lives in and out of the classroom. Additionally, I cannot wait to engage all of our alums, many of whom I have been close to for several decades, friends and the entire William & Mary family. It is truly a blessing to be back!" Shackford was the head women's soccer coach at Princeton from 1995-2014 where she built the Tigers into a consistently successful program that regularly produced championship teams. She is the all-time wins leader at Princeton (203) and guided the Tigers to an NCAA College Cup Semifinal, six Ivy League titles and eight berths into the NCAA tournament. Shackford coached seven Ivy League Players of the Year, 40 First-Team All-Ivy League selections and three United Soccer Coaches (formerly National Soccer Coaches Association of America) All-Americans. She recruited and coached several national team players and three who went on to become professional athletes in the National Women's Soccer League, including two-time Olympic medalist Diana Matheson. The Tigers won 10 games, or more, in 16 of her 20 years on the sidelines. For her efforts, she was named the USC Mid-Atlantic Regional Coach of the Year in 2001, 2004 and 2012. Most importantly, 100 percent of Shackford's student-athletes went on to graduate from Princeton. Her best season at Princeton came in 2004 when she led the Tigers to their first NCAA College Cup Semifinal appearance, which remains the only national semifinal trip for any Ivy League member. The team finished the season with a 19-3 record and earned wins against Central Connecticut State, Villanova, Boston College and Washington to advance to the semifinals, before falling to her former Tribe teammate and current U.S. Women's National Team Coach Jill Ellis and UCLA. For her efforts, she was named the Division I National Coach of the Year and Soccer Buzz Coach of the Year. "I have known Julie as a teammate, colleague, and as a close personal friend, and she is quite simply an amazing human being," stated Ellis '88. "Our passion for soccer brought us together, but Julie's loyalty, professionalism and kindness has kept us as close today as when we were freshmen on campus. Julie is one of a kind, and I am delighted our Alma Mater has chosen her to lead our women's soccer program. Her passion for soccer, vast experience, and love for William & Mary are a perfect blend to establish a dynamic and successful program." Prior to Princeton, Shackford led the women's soccer program at Carnegie Mellon from its inception in 1990 until 1995. She boasted a 42-21-3 record during her time in Pittsburgh. Shackford was a four-year standout for the Tribe from 1984-1987 appearing in 68 career games. She finished her career with 20 goals, nine assists, and 49 points, while helping the Tribe to four consecutive NCAA Tournament berths. Shackford was a three-time All-American and was elected to the W&M Athletics Hall of Fame in 2001. Aside from her vast experience at the collegiate ranks, Shackford has continued to shape her resume in many other facets and levels of the sport. She owns a U.S. Soccer Federation 'A' License and is a USC State Diploma Course Instructor. On the national level, Shackford has assisted with the U20 and U21 US National Team programs from 2000-02, and served as a scout for the U.S. Women's National Team. She also was a Region I Staff Coach with the Olympic Development Program from 1990-2000. Most recently, she served as one of the Directors of FCVirginia's Development Academy in the Northern Virginia area. In this role, she was responsible for coaching four different teams composed of elite players and played a major role in leading each squad to successful seasons. Additionally, Shackford's duties included evaluating players for the college game. The Development Academy was instituted by U.S. Soccer to put a more effective player development infrastructure in place. A 2001 inductee of the W&M Athletics Hall of Fame, Shackford has received numerous other awards. She is a 2011 inductee of the DC-VA Hall of Fame, a 2015 selection into the Mercer County (NJ) Hall of Fame and was named as the 2006 Spirit of the Game Award winner by the Intercollegiate Soccer Officials Association of N.J., to list just a few. She earned her bachelor's degree in government from William & Mary before earning her master's degree in public management at Carnegie Mellon in 1995. A native of Burke, Virginia, Shackford is married to Bo Wilhelm and the couple is raising five children, Savannah and Kevin Wilhelm and Kayleigh, Cameron and Keegan Shackford.